Use this discreet bolt system to open and close just about anything only after a PIN entry on a keypad. An easy way to control a lock bolt using a micro linear actuator is with a programmable membrane switch keypad. A simple access control system for cupboards, cabinets, refrigerators, and other doors is a user-friendly solution to keeping unwanted snoopers out and dangerous goods away from young curious fingers. 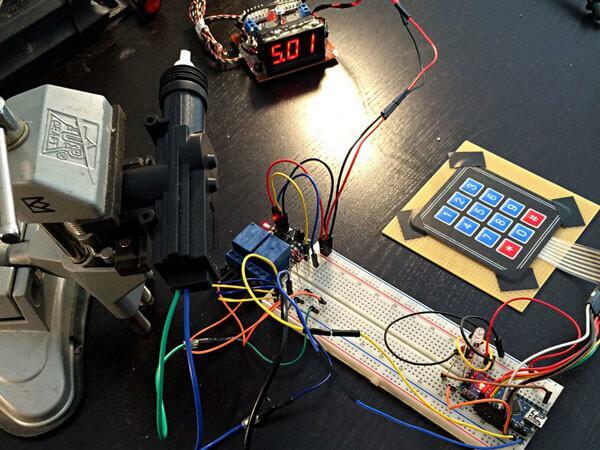 Using a 4x3 membrane switch keypad, an Arduino Nano microcontroller, and a small electric linear actuator to drive a discreet bolt system, anything that opens and closes can be set to do so only after a PIN entry on a keypad. Extract its contents, and put a folder named "Keypad" in your libraries folder. The contents of the Keypad-master.zip must be placed in that folder, do not extract it all into the libraries folder without creating the "Keypad" folder. If the Arduino program is open, close it and start it up again. First insert the Arduino Nano into the breadboard, making sure that the two rows of pins are on either side of the furrow in the middle. 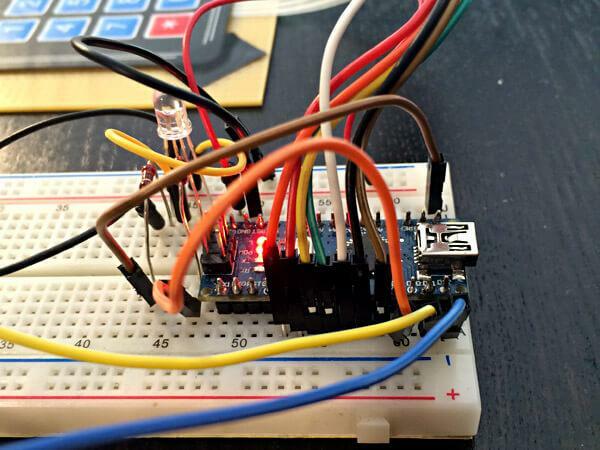 TIP: Position the USB mini port so that it faces outward from the breadboard. This way it will not clutter up your wiring with a USB cable running through it. 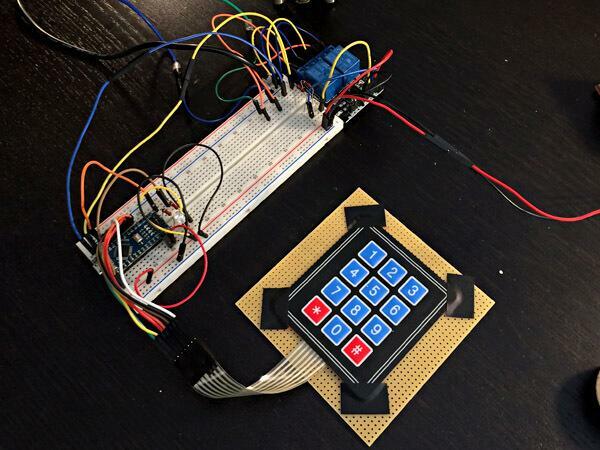 The 4x3 keypad used in this tutorial has 7 female pin sockets, all of which need to be wired to the Arduino. The keypad module uses 1, 2, 3, 4, for ROW0, ROW1, ROW2, ROW3, and pins 5, 6, 7 for COL0, COL1, COL2. X denotes COL(UMNS), Y denotes ROW(S), (sinus and cosinus values are inverted for convenience). Pins range from 1 to 7, with the keypad's buttons facing toward you, left to right. Now it’s time to wire up the RGB LED. The only colors needed for display are: red and blue. From left to right (the LED has a flat side on its head) the pinout is RED, GND, GREEN and BLUE. Wire 5V to GND (Common anode) and set a 220 ohm resistor in series from pin 1 to D9 on your Arduino. Next, set a 220 ohm resistor in series from pin 4 to D8 on your Arduino. Next, take the dual channel relay. On the relay terminals, there should be text something like 'NO1', 'COM1','NC1' etc. Normal-open is the terminal port to insert a wire into if you want it to be ON when you activate that relay channel. When it is activated, you continue the circuit via the COM port, and from there to your micro linear actuator. NC is similar to NO, it just completes a connection when the relay is OFF instead of ON. H-bridges and motor shields are typically reserved for super-fast operation, but since we only need to switch polarity based on a command or condition (ex. the correct pin code entered), the relay can function as an H-bridge. 12V VIN/VOUT from COM1/COM2, alternating, but never both ON or OFF simultaneously. Once correctly wired up, you will have a simple way to safeguard your valuables or dangerous goods. You can also customize the code to fit your own design and function requirements. For example, you could add a timeout, after which the actuator locks again. To operate the keypad, hold "*" a short moment to enter PIN entry mode. The RGB LED will blink violet three times. Then you can enter your own custom PIN code. There should be one violet blink for each digit entered. When you have finished entering the PIN code, hold "#" a few seconds. The LED will blink blue if the entry is correct, or red if it is incorrect. If it is correct, your electric linear actuator will extend or retract, depending on its current state.